I am a very busy person. My students know this, my colleagues know this, and my running community knows this. Working for the Philharmonic has been an absolute joy and I have poured myself into creating a job full of organization and knowledge. Being hired as Artistic Coordinator meant filling a position that had not yet been created for the New Mexico Philharmonic. There was no job aide to help me figure out what I needed to be doing or when I needed to be doing it. I’ve spent this season really trying to formulate a schedule and methodology that could potentially be passed down if I ever need to leave this position. This is how I operate in all of my management and teaching roles. So, with working for the Young Musician Initiative as a head instructor, working for the Philharmonic as the Artistic Coordinator, maintaining my full studio, (oh and that training thing I seem to have acquired over the last 3 years) I’ve been having less performance time on my card. When I get the phone call to perform, if it fits in my schedule (even BARELY, like this past weekend), I pretty much say yes and have my music performance ready a week out because I’m so eager to be on stage! This past weekend I had the opportunity to perform with Quintessence – Choral Arts of the Southwest on their A Sense of Place program(www.quintessence-abq.org). What a fantastic program this vibrant group of musicians put on! Congratulations to the whole group and the Artistic Director, Matt Greer. His programing makes the audience excited and leaves them anticipating the next concert. I was thrilled to be apart of such a fantastic group. This weekend we performed Alice Parkers: Kentucky Psalms, a beautiful 4 movement piece for String Quintet and Flute (along with the Choir -but of course I just assumed you knew that). The piece was fun and featured the flute in some very noodle-y passages that outlined the melody of the voices. I prepared the piece at its suggested tempi and was lucky to find out that the last movement was performed at a perfectly energetic tempo , which made the flute line pop out with ease! I also made my Native American Flute debut in Judith Clouds: Mesa Songs. Now I love playing around on my very basic NA Flute, but I’ve never performed on it. When preparing to play this piece, my NA flute was a bit pitchy (I actually hate that word, but I watched the voice last night and can’t think of anything else – I mean it is their go to phrase for bad intonation and lack of training…I digress). Being an opportunist and lover of ethnic flutes, I took this as a sign that I needed to have a new flute added to my collection. Off to Apple Mountain Music I went and I’m now the owner of a beautiful sycamore High Spirit D-Flute! I thought it sounded like the wind playing in both sanctuaries. Oh! Matt’s brilliant artistic decision to have me perform at the back of the sanctuary behind the audience was a hit. When I spoke to patrons, post concert, many of them hadn’t a clue I was behind them. They figured I was in the wings or balcony (respectively to both church venues) and were surprised to find me right behind them during the applause! I have to say, playing the NA flute was such a great experience. Although on Saturday I had to dash off immediately following my performance portion of the program, I did get to enjoy the rest of the concert on Sunday. Cello soloist with the NM Phil this weekend, Lynn Harrell, said during his enthusiastic applause to guest conductor Joshua Weilerstein (Assistant conductor of the NYPhil), “We really do have the best career” and I couldn’t agree more. I think being involved in this career in every possible way, I am most definitely the lucky one. 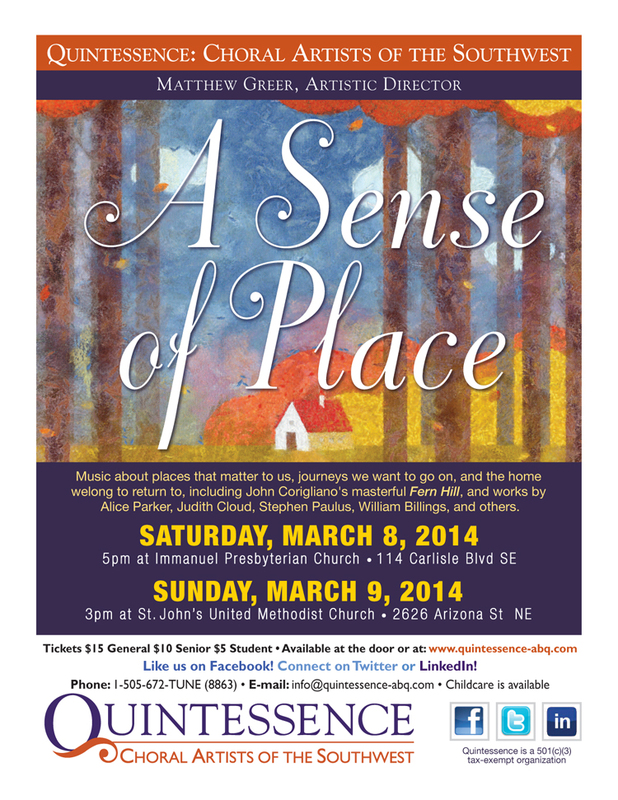 Be sure to check out the upcoming concerts of Quintessence at http://www.quintessence-abq.org. Also St John’s Choir will be performing Mozart’s Requiem with the NM Phil in a couple weeks , as always check out, http://www.nmphil.org.